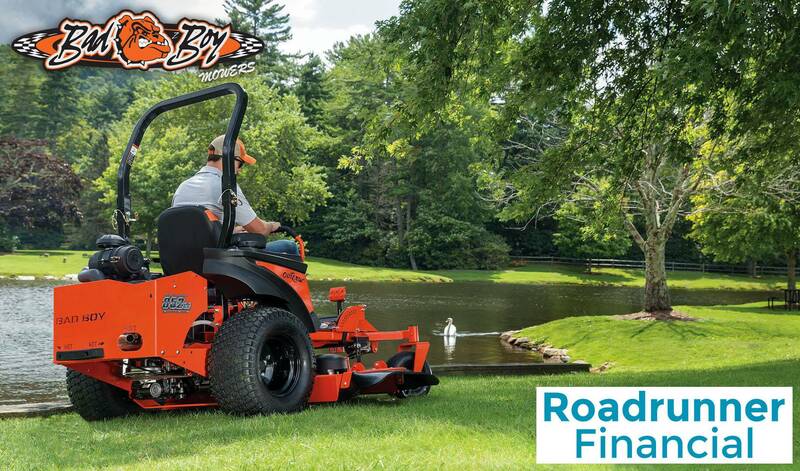 Bad Boy Mowers has partnered with Roadrunner Financial to provide installment loans for purchases of Bad Boy Mowers. *Disclosures: The following financing programs are offered by Roadrunner Financial, Inc.. All applicants are subject to credit approval. Approval, rates, minimum purchase requirements and terms advertised are based upon the minimum credit bureau (FICO®) score indicated and overall credit worthiness. Your FICO® Credit Score, key factors and other credit information are based on data from Experian® and may be different from other credit scores and other credit information provided by different bureaus. Offer applies to a maximum of 2 units per applicant. Other qualifications and restrictions may apply. Minimum amount financed is $1,000. Maximum amount financed is $25,000. UCC filing fee may be charged. Offer not valid for mowers used for commercial purposes. Offer effective on eligible and qualified Bad Boy Mowers purchased from a participating Bad Boy Mower dealer. Offer valid in the U.S. only. Other financing offers are available. See your local dealer for details. Financing promotions void where prohibited. Offer subject to change without notice.